With that in mind, The Man Who Laughs, a “silent film for the stage,” written by Kiran Rikhye and directed by Jon Stancato, is a clever and entertaining throwback to a simpler time when the narrative conventions of film were new and exciting. It is both a fun geek-out on high tech, high concept theater, and at the same time a reassuring return to the narrative foundations of drama. The establishing title tells us the scene is England in 1686. In the first scene we see a little boy (Noah Schultz) who has escaped from an orphanage wandering in the woods. A group of comprachicos find him, mutilate his face into a grinning mask, and name him Gwynplaine. They display him for profit as a freak, until a royal warrant is issued for their arrest, and they abandon the boy in the harsh winter to fend for himself. He wanders and finds a criminal in a gibbet, an infant girl, whom he rescues, clinging to her mother’s corpse in a snow bank, and finally to the caravan of a ventriloquist circus performer Ursus (Jon Froehlich) who takes them in. Time passes, and the adult Gwynplaine, played with evocative surety by the talented Dave Droxler, has made a family with Ursus and the newly grown up Dea (Molly O’Neill). The plot follows the general outline of Victor Hugo’s novel The Man Who Laughs, dropping the backstory about Gwynplaine’s noble heritage, but keeping the tragic ending the 1928 silent movie left out. Gwynplaine wants to be loved for his inner self, not his grotesque deformity. The evil duchess Josiana (Rebecca Whitehurst) seeks a sadistic thrill from sexually exploiting the freak, and her friend Lord Dirry-Moir (Raife Baker) plays her pandar until a tragic accident destroys them all. True to Hugo, the play is a tragedy, though Ms. Rikhye twists the knife in our hearts by allowing Gwynplaine to live (he kills himself in the book), as if torture and suffering cannot even end themselves in death. 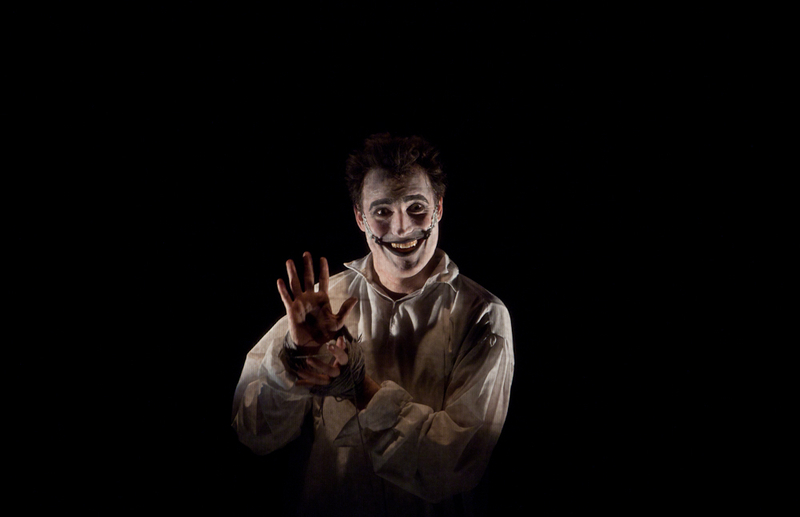 More interesting than the melodrama itself, The Man Who Laughs is a play about theatre in the age of technology. It contains a play within the play, but it also plays with the conventions of early silent movies. A scrim hangs between the players and the audience. During action scenes the stage is lit, and the actors mime their roles. At appropriate intervals the stage lights go down, and titles are projected onto the scrim. The theater has been appropriately designed to look like an old cinema, including a false proscenium built around the scrim. This is familiar territory for Ms. Rikhye and Mr. Stancato, who have worked on a series of previous plays that take cinema to be their conceptual starting point. In order to achieve their intended cinematic effect, the makeup crew Jaclyn Schaefer and Stephanie Cox-Williams created a wonderfully horrific look for the actors that represents both Hugo’s grotesquery and the disturbing chiaroscuro of early cinema. 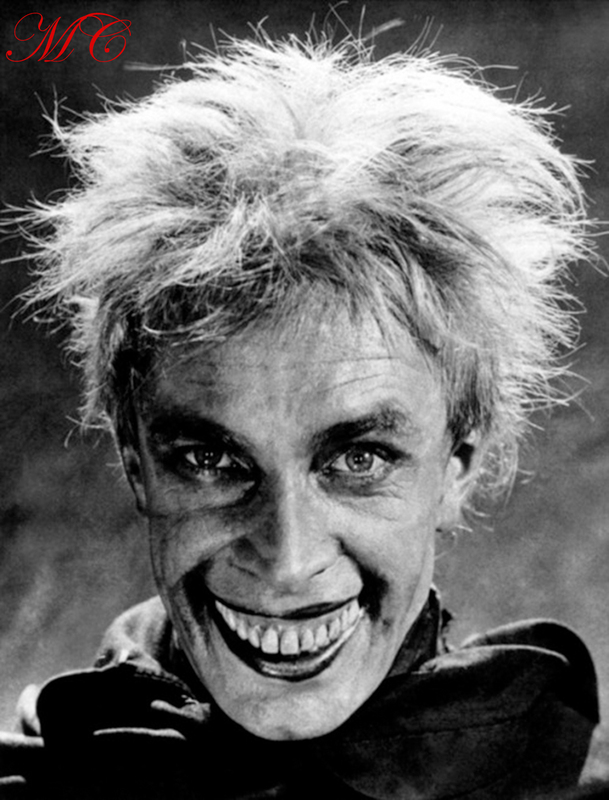 The look the makeup designers have created is a nice variation on Conrad Veidt’s iconic mask in Paul Leni’s German expressionist version of Hugo’s novel, which itself was the inspiration for the DC comics character The Joker. The Man Who Laughs’s focus on technical innovation and allusion potentially overshadows the drama. This was definitely the case on the afternoon I saw the play. A fuse blew and the title projector shut down. In an display of true professionalism, the players continued with the scene, but the techs stopped the show to get the moving pieces back in order. When the lights came up on Ursus’s caravan (an interior location), the snow machine came on inexplicably, which sent a ripple of laughter through the theater. Technical problems like that remind us that one of the virtues of live performance is its unpredictability, and in the entertainment world unpredictability — a high wire act without a net — makes for authentic drama. It also reminds us that the dramatist’s most powerful tool isn’t scenery, props, or makeup; it’s the audience’s imagination, the viewers’ inner eye. Painting a scene there will always produce the most vivid experience. a bit less common with regards to seems. Employing this site, you consent to the Conditions of Privacy and Use Policy. They can be manufactured from perhaps a fraction, stainless, metal or birdwatcher! this is my first time ever utilizing an airbrush. each include their own character. The Dunlop Ultex kinds that are large are used by me currently and they’re wonderful.